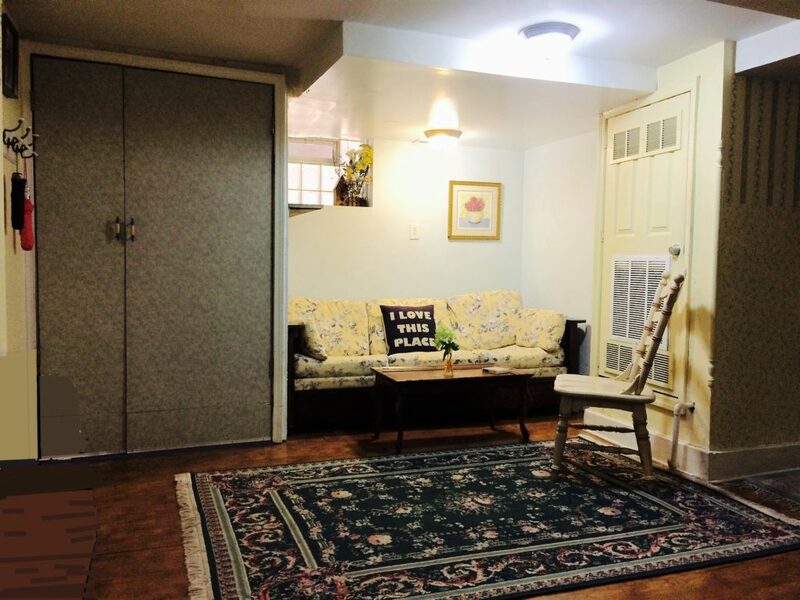 Alice's Annex is a spacious 2-bedroom garden-level apartment. It offers a living room, book-filled study, kitchenette, sitting area, dining nook, full bathroom, sound system with in-wall speakers, complimentary en-suite front-load washer and dryer and private entrance. To sleep, there is a queen bed in Bedroom 1, a full bed in Bedroom 2, and the sofa opens to a queen bed. "I stayed in "Alice's Hideaway" for about 5 months. I can't give enough praise for how enjoyable it was. If I could give it 10 stars I would." The LIVING ROOM offers a comfortable sofa, chair and original art above a wood-look Pergo floor. The comfortable sofa is actually a queen-sized sleeper for an extra guest or two. A separate SITTING AREA offers a love-seat and arm chair to enjoy viewing the cable flat screen television with DVD player or playing a variety of board games. A tiger-oak desk is the highlight of the STUDY, and there are dozens of books on the floor-to-ceiling bookshelves, as well as a deep closet. 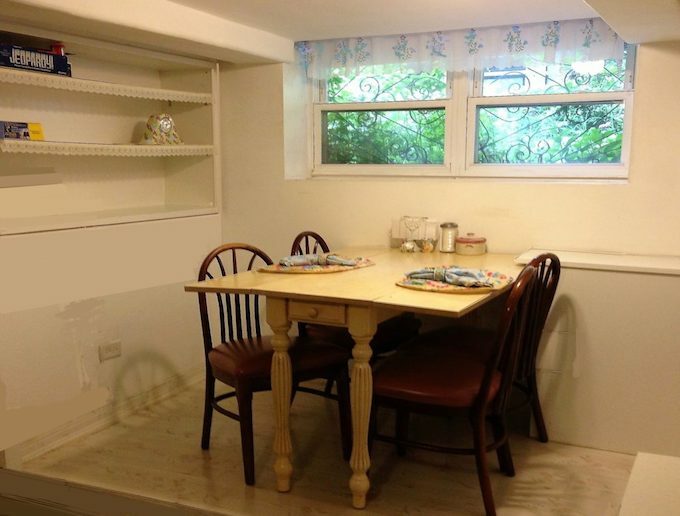 The DINING NOOK on a raised platform faces south via a large sunny picture window overlooking the garden. Shelving is convenient for keeping extra kitchenware handy. 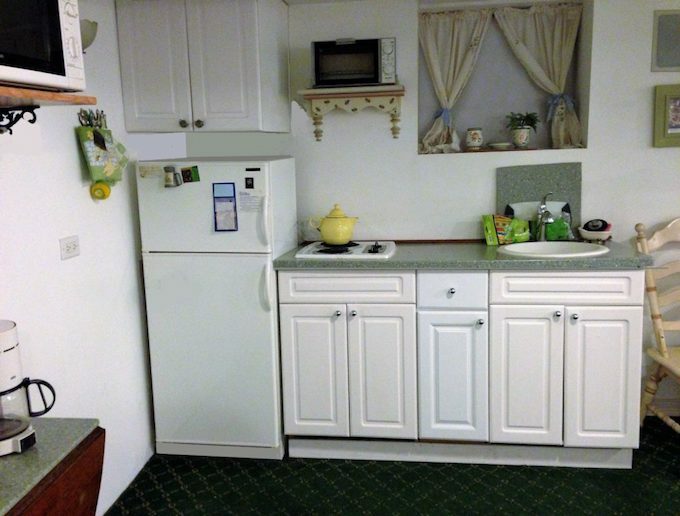 The KITCHENETTE includes a full-sized refrigerator, 2-burner electric cook top, coffee maker, microwave, blender, counter convection oven, granite-like counters and sink and all kitchenware. 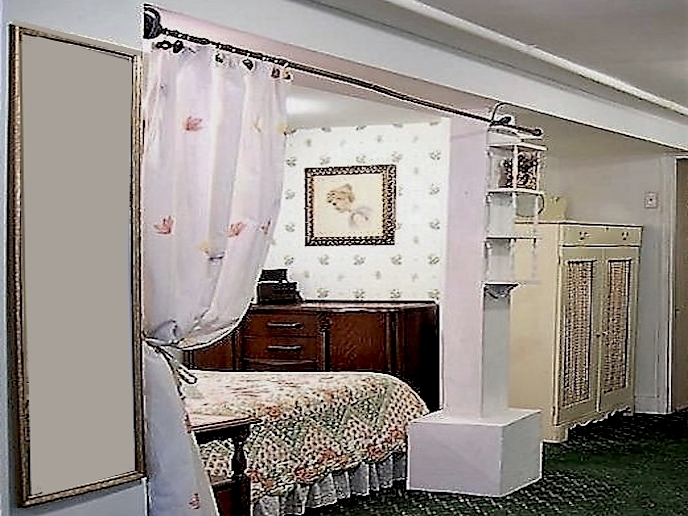 BEDROOM #1 is decorated with hand-painted furnishings modeled after a Victorian "painted lady." 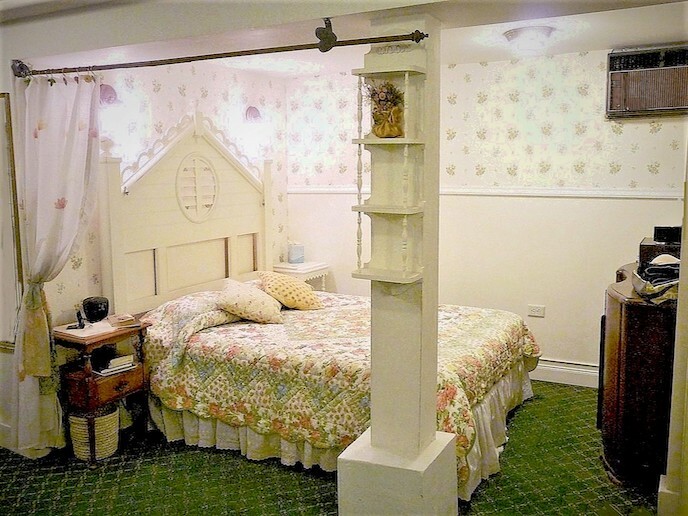 Even the queen bed, covered with a handmade quilt, is topped by a large headboard reminiscent of a Victorian gabled roof line, with its round vented “attic window”. A delightful carved armoire can house one's clothing, as can the large triple dresser. BEDROOM #2 has a single bed, large oak armoire, unique night stand, small dresser and storage bench. Around the corner is a deep walk-in closet. The BATHROOM has a shower over the tub, linen shelves and roomy storage vanity. The LIVING ROOM offers a comfortable sofa, chair and original art above a wood-look Pergo floor. The comfortable sofa is actually a queen-sized sleeper for an extra guest or two, facilitated by one of the extra deep closets in this unit. "I stayed at Alice's twice and each time I spent several months at this beautiful place. It was always like this: as soon as I had arrived I felt at home instantly. This was partly so because the place is spacious and beautifully furnished with antiques, it is well equipped." A separate SITTING AREA offers a love-seat and arm chair to enjoy viewing the cable 35" flat screen television with DVD player or playing a variety of board games. 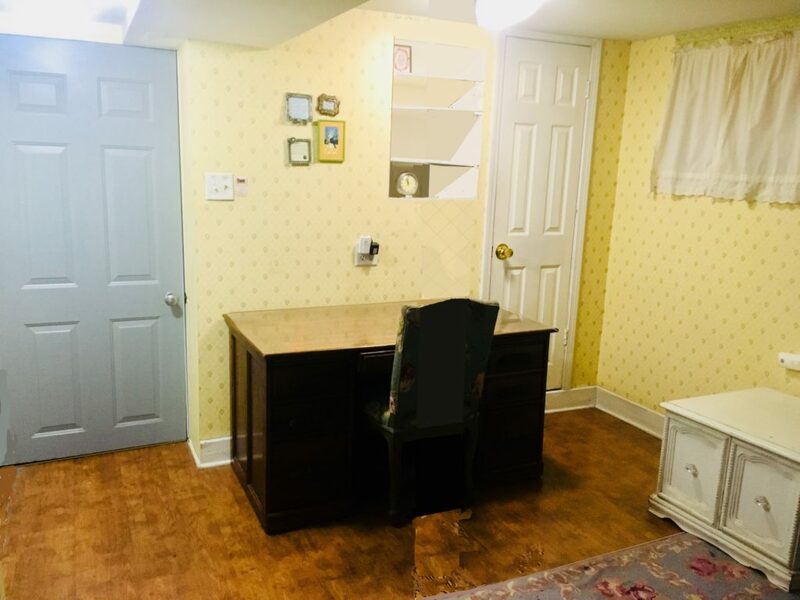 "We really enjoyed our one-year stay at Alice's and becoming acquainted with two interesting folks"
A tiger-oak desk is the highlight of the STUDY, and there are dozens of books on the floor-to-ceiling bookshelves, a 3-drawer oak dresser and an extra deep 7-foot closet. "It had everything I can imagine from comfortable interiors, a study, loads of books, kitchen with all the utensils, a dinning, a living room, TV with thousands of channels, cooling & heating provisions, wifi, laundry. I mean everything and decently priced too." The sunny DINING NOOK on a raised platform faces south via a large picture window overlooking the garden. Shelving is convenient for keeping board games or extra kitchenware handy. "All in all, Alice's was a great place to be, and Yes, leaving Chicago was sad, and we hope to visit again." The KITCHENETTE includes a full-sized refrigerator, 2-burner electric cook top, stainless oven, coffee maker, microwave, blender, granite-like counters and sink and all kitchenware. "Beautiful kitchen and great washer and dryer. The glasses and pots were enough for us." 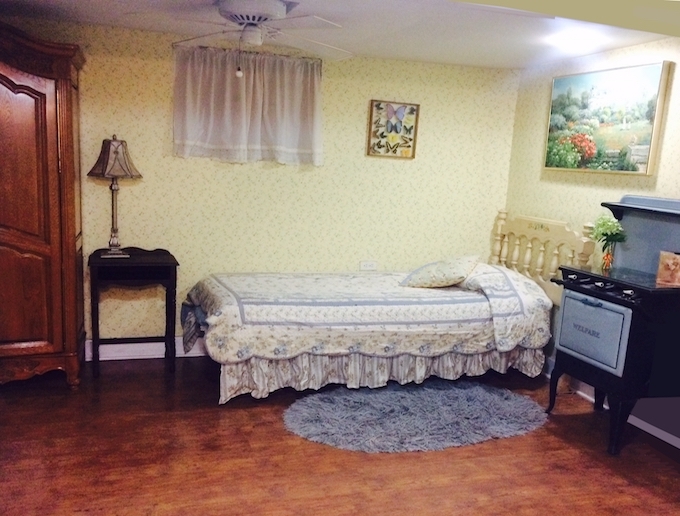 "Our stay at the Alice Annex of the Aster House was great!!" BEDROOM #2 has a full bed, large oak armoire, small dresser and night table. Around the corner is one of two 7-foot deep walk-in closets. "Best Home to live in Chicago. I felt like Alice In wonderland living here." 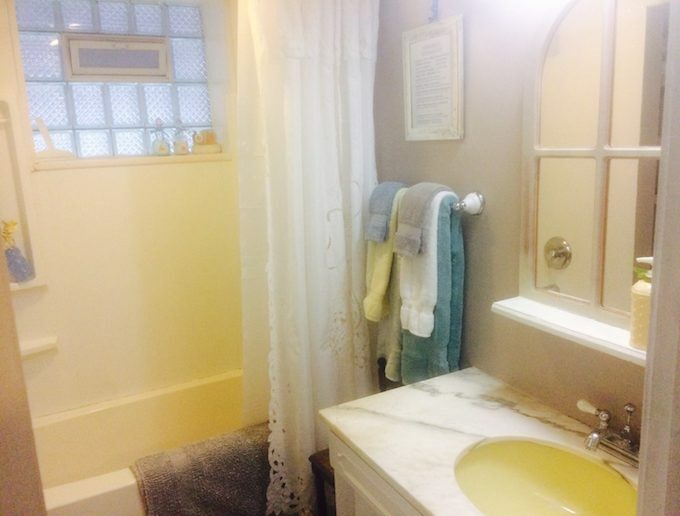 The BATHROOM has a shower over the tub, linen shelves and a roomy storage vanity. 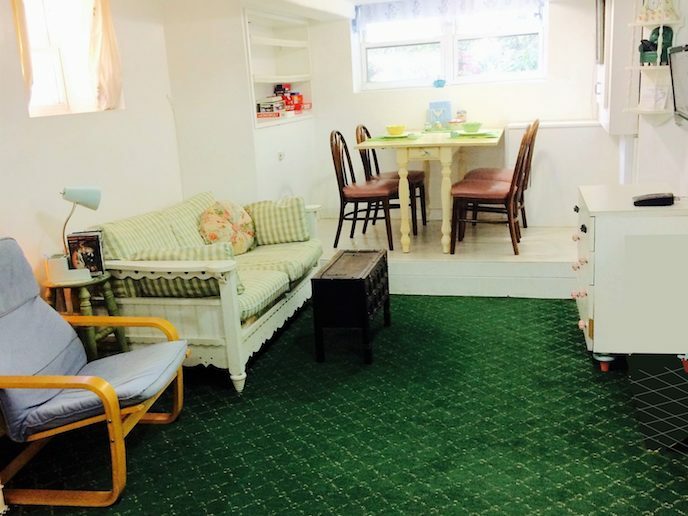 "Alice was very roomy and bright and would service a smaller family well. The apartment was well stocked with soaps, shampoo, etc." 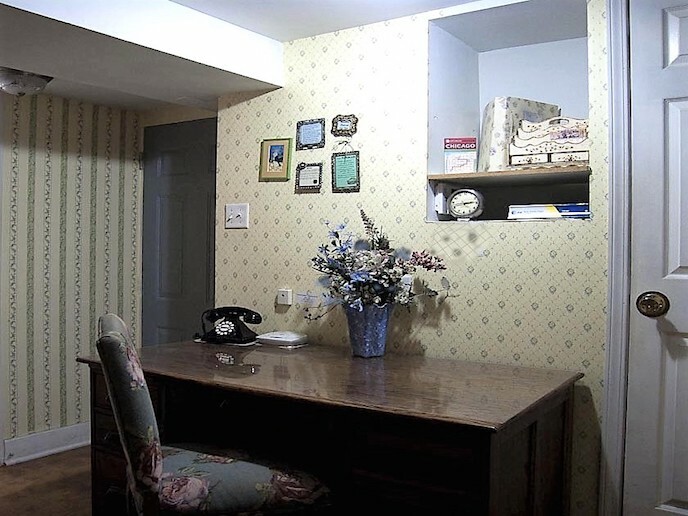 "If just the 2 of us return to Chicago, we would happily rent the smaller unit, Alice."